Since World War I, there have been 10 Republican presidents, who have been primarily known for being fiscally conservative according to the GOP platform. But if we look back at history, they did not all follow these stereotypical Republican policies. These include tax cuts, debt reduction, spending cuts except for defense, and a balanced budget. Instead, many of these presidents responded with expansionary fiscal policy to pull the country out of recessions. Here's an analysis of these 10 presidents, their economic policies, and how much they followed Republican tradition. Warren G. Harding said, "Less government in business and more business in government." During his term, Republicans eliminated regulations established during World War I. They cut taxes, especially for corporations and the wealthy. They established a federal budget under the Budget and Accounting Act of 1921. It required all the federal departments to submit a unified budget under the president. It also established the General Accounting Office. Harding's administration made U.S. banking more competitive internationally. It helped to rebuild Europe after World War I. Harding established an open-door trading policy in Asia. His administration negotiated trade deals with Malaysia and the Middle East. He also supported trade protectionist measures such as tariffs and limits on immigration. Those were Republican policies until the 1930s. Harding supported policies that are not traditionally Republican. He hosted a global naval disarmament conference that helped cut military spending. Harding's budget cut $2 billion from the debt. That's a 7 percent decrease from the $24 billion debt at the end of Woodrow Wilson's last budget, Fiscal Year 1921. Wilson had to pay for World War I. Several of Harding's appointees became involved in scandals. That damaged public faith in the government. Calvin Coolidge said, "If the federal government were to go out of business, the common run of people would not detect the difference.” During his term, America transformed from a traditional to mixed economy. The U.S. gross domestic product increased by 42 percent. New construction doubled. Unemployment remained below the natural rate of around 4 percent. The United States produced half the world's output, since World War I had destroyed most of Europe. That prosperity allowed Coolidge to cut government spending. He reduced the national debt by $5 billion. That was a 26 percent decrease from the $21 billion debt at the end of Harding's last budget, FY 1923. Coolidge was isolationist and protectionist at a time Americans were afraid of the newly formed Soviet Union. He set high tariffs on imported goods to protect domestic industries. He rejected U.S. membership in the League of Nations. Coolidge investigated the scandals from the Harding administration. That restored the American people's faith in their government. That confidence helped spur the Roaring Twenties. Coolidge helped create the theory of supply-side economics with his Treasury secretary Andrew Mellon. He cut taxes so that eventually only the very wealthy paid any at all. Although average income rose from $6,460 to $8,016 per person, it wasn't distributed evenly. In 1922, the top 1 percent of the population received 13.4 percent of the nation's income. That rose to 14.5 percent by 1929. Coolidge also said, “The chief business of the American people is business.” He removed the threat of regulatory commissions by staffing them with those sympathetic to business. Coolidge admitted in later years that his pro-business policies may have contributed to the bubble that culminated in the Great Depression. Herbert Hoover became president in March 1929. The recession that became the Great Depression began in August. The stock market crashed in October. The rest of Hoover's presidency was consumed by his response to the Depression. Hoover was an advocate of laissez-faire economics. He believed an economy based on capitalism would self-correct. He felt that economic assistance would make people stop working. His biggest concern was keeping the budget balanced. As the Depression wore on, government revenue fell. To keep from running a deficit, Hoover cut spending. Even when Congress pressured Hoover to take action, he focused on stabilizing businesses. He believed their prosperity would trickle down to the average person. Like any good Republican, Hoover lowered the tax rate to fight the depression. In 1929, he lowered the top rate one point, to 24 percent. In December 1930, he raised it back to 25 percent. In 1932, the economy shrank 12.9 percent. But Hoover raised the top rate to 63 percent to reduce the deficit. His commitment to a balanced budget worsened the depression. He asked Congress to create the Reconstruction Finance Corporation. It lent $2 billion to failing businesses to prevent more bankruptcies. It also lent money to states to feed the unemployed and expand public works. He felt strongly that caring for the unemployed was a local and voluntary responsibility, not a federal one. In 1930, Hoover signed the Smoot-Hawley Tariff Act. By 1931, the economy had contracted 27 percent since its peak in August 1929. Other countries retaliated. This global protectionism shrank global trade by 66 percent by the depths of the Depression. Since then, most politicians are against protectionism. Despite his desire for a balanced budget, Hoover added $6 billion to the debt. That was because the Depression reduced tax income for the federal government. That was a 33 percent increase from the $17 billion debt at the end of Coolidge's last budget, FY 1929. In domestic policy, President Eisenhower pursued a middle course. He continued most of FDR's New Deal and Truman's Fair Deal programs. He increased the U.S. minimum wage. He also created the Department of Health, Education, and Welfare. It absorbed the function of the Federal Security Administration. He expanded Social Security to cover an additional 10 million Americans, including government workers and the military. He raised both benefits and payroll taxes. Eisenhower ended the Korean War in 1953. That created a recession in July 1953 that lasted until May 1954. The economy contracted 2.2 percent in the third quarter, 5.9 percent in Q4, and 1.8 percent in Q1 1954. Unemployment reached its peak of 6.1 percent in September 1954. But, like a good Republican, Eisenhower emphasized a balanced budget. He decreased military spending from $526 billion to $383 billion. He promoted the "Atoms for Peace" program, which emphasized sharing atomic knowledge for peaceful purposes instead of weapons. He created the U.S. Information Agency and promoted use of the CIA to achieve military goals through influence, not warfare. As part of a domestic defense strategy, Eisenhower created the Interstate Highway System in 1954. It built 41,000 miles of road that linked 90 percent of all cities with populations of more than 50,000. The federal government allocated $25 billion to the states to build it for over 13 years. It set up the Highway Trust Fund to collect gas taxes that would pay for it. It would allow safe transports in case of a nuclear war or other military attacks. In 1957, Dwight Eisenhower created NASA to advance U.S. leadership in rocketry, satellites, and space exploration. Another recession occurred from August 1957 to April 1958. The Federal Reserve caused it by raising interest rates. That helped reduce federal revenue. As a result, Eisenhower added $23 billion to the federal debt. That was a 9 percent increase from the $266 billion debt at the end of Truman's last budget, FY 1953. Richard Nixon veered from traditional Republican policies. In 1969, the new president announced the Nixon Doctrine. It reduced U.S. military involvement in the Vietnam War. He told U.S. allies to take care of their own defense but would provide aid as requested. Nixon was responding to anti-war protests to end the Vietnam War. The Doctrine also outsourced protection of the Middle East oil supply to the Shah of Iran and Saudi Arabia. Between 1969 and 1979, the United States sent $26 billion in arms to the two countries to defend against communism. This arrangement continued until the Russians invaded Afghanistan in 1978 and the Shah was overthrown in the 1979 revolution. Nixon only added $121 billion to the $354 billion national debt during his term in office, but his Doctrine made the long-term impact much greater. The Doctrine allowed Nixon to decrease defense spending from $523 billion to $371 billion. In 1971, he implemented the "Nixon Shock." First, he imposed wage-price controls that bypassed America's free market economy. Second, he closed the gold window. The Fed would no longer redeem dollars with gold. That meant the United States abandoned its commitment to the 1944 Bretton Woods Agreement. Third, he imposed a 10 percent tariff on imports. He wanted to reduce the U.S. balance of payments. But it also increased import prices for consumers. This helped push inflation into the double digits. In 1973, Nixon ended the gold standard entirely. The dollar's value fell until you needed $120 to buy an ounce of gold. The value of oil, which is priced in dollars, plummeted as well. OPEC embargoed its oil shipments in a desperate attempt to boost its price. The history of the gold standard expalins why the dollar was backed by gold. The Nixon Shock created a decade of stagflation. That combines economic contraction with double-digit inflation. By 1974, inflation was 12.3 percent. The economy had contracted 0.5 percent. By 1975, the unemployment rate peaked at 9 percent. Inflation hovered between 10 and 12 percent from February 1974 through April 1975. 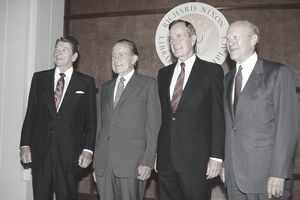 Nixon followed Republican policies with the Budget Control Act of 1974. It established the federal budget process. It also created the Congressional budget committees and the Congressional Budget Office. The 1974 Watergate break-in eroded the public's faith in government. In 1964, polls showed that 75 percent of Americans trusted elected officials to do what was right for the country. By 1974, only a third believed so. This lack of faith led to Ronald Reagan's election in 1980. It created public belief in trickle-down economics, which in turn led to increasing economic inequality. Gerald Ford inherited stagflation. He first tried to whip inflation with contractionary fiscal policy. He even embraced the idea of a wage-price freeze. After that didn't work, he reversed course and adopted expansionary policies. In 1975, he gave taxpayers a 10 percent rebate, increased the standard deduction, and added a $30 tax credit per family member. He added a 10 percent business investment tax credit. Ford also signed a spending package. He also proposed deregulation measures, but they didn't pass Congress. By 1976, the recession had ended. It helped that the Fed lowered interest rates. Ford's expansionary policies added $224 billion to the debt. That was a 47 percent increase from the $475 billion debt at the end of Nixon's last budget, FY 1974. Ronald Reagan faced the worst recession since the Great Depression. The economy was mired in stagflation. Reagan promised to reduce government spending, taxes, and regulation. He called these traditional Republican policies, Reaganomics. Instead of reducing spending, he increased the budget by 2.5 percent annually. During his first year, he cut domestic programs by $39 billion. But he increased defense spending from $444 billion to $580 billion at the end of his first term and $524 billion at the end of his second term. He sought to achieve "peace through strength" in his opposition to communism and the Soviet Union. Reagan also expanded Medicare. Reagan cut income taxes from 70 percent to 28 percent for the top income tax rate. He cut the corporate tax rate from 48 percent to 34 percent. Reagan's tax cuts worked because tax rates were so high in the early 1980s that they were in the "prohibitive range" on the Laffer Curve. But Reagan increased the payroll tax to ensure the solvency of Social Security. Instead of reducing the debt, Reagan more than doubled it. That was despite the 1985 Gramm-Rudman-Hollings Deficit Reduction Act, which triggered automatic spending cuts. He added $1.86 trillion, a 186 percent increase from the $998 billion debt at the end of Carter's last budget, FY 1981. Reagan reduced regulations, but it was at a slower pace than under President Jimmy Carter. He eliminated the Nixon-era price controls. He further removed regulations on oil and gas, cable television, long-distance phone service, interstate bus service, and ocean shipping. He eased bank regulations with the 1982 Garn-St. Germain Depository Institutions Act. It removed restrictions on loan-to-value ratios for savings and loan banks. But that led to the Savings and Loan Crisis of 1989. Reagan increased trade barriers. He doubled the number of items that were subject to trade restraint from 12 percent in 1980 to 23 percent in 1988. But he also proposed the North American Free Trade Agreement to compete with Europe's common market. To combat inflation Reagan appointed Federal Reserve Chairman Paul Volcker to reduce the money supply. He raised the fed funds rate to 20 percent. It ended inflation but triggered a recession. It created a 10.8 percent unemployment rate, the highest in any recession. Unemployment remained above 10 percent for almost a year. George H.W. Bush campaigned on reducing the debt without raising taxes when he said, "Read my lips. No new taxes." But Bush first had to face the 1990-1991 recession caused by the S&L banking crisis. Ironically, deregulation under the Reagan administration had caused the crisis. The unemployment rate rose above 7.7 percent in 1992. The 1990 recession reduced revenue. Bush was hamstrung by another Reagan-era decision, the Gramm-Rudman-Hollings Balanced Budget Act of 1985. It mandated automatic spending cuts if the budget wasn't balanced. Bush did not want to cut Social Security or defense. As a result, he agreed to tax increases suggested by a Democrat-controlled Congress. That cost him the support of the Republican party when he ran for reelection in 1992. He followed post-Hoover Republican free trade policies by negotiating NAFTA and the Uruguay trade agreement. Bush also followed Republican pro-defense policies when he responded to Iraq's invasion of Kuwait in 1990 by launching the first Gulf War. That created mild inflation as gas prices spiked. He launched a war in Panama to overthrow General Manuel Noriega. He had threatened the security of the Panama Canal and the Americans living there. But he also cut military spending from $523 billion under President Reagan to $435 billion in his last budget. The stock market, as measured by the S&P 500, gained 60 percent during his term. Bush added $1.554 trillion, a 54 percent increase from the $2.8 trillion debt at the end of Reagan's last budget, FY 1989. George W. Bush faced three of the nation's worst challenges during his administration: the 9/11 attacks, Hurricane Katrina, and the 2008 financial crisis. Bush fought the 2001 recession with the tax rebate of the Economic Growth and Tax Relief Reconciliation Act. In 2014, he enacted the business tax cuts of the Jobs and Growth Tax Relief Reconciliation Act to jump-start hiring. The combined Bush tax cuts added $1.35 trillion over a 10-year period to the debt. Bush responded to the al-Qaida attack on September 11, 2001, with the War on Terror. He started the War in Afghanistan to eliminate the threat from al-Qaida's leader, Osama bin Laden. He created the Homeland Security Act to coordinate terrorism intelligence in 2002. He then launched the Iraq War in 2003. In total, Bush spent $850 billion on the two wars, while expanding funds for the Department of Defense and Homeland Security which cost $807.5 billion. To pay for two wars, military spending rose to record levels of $600 billion to $800 billion a year. Bush went against Republican policy by promoting increased government spending on health care. The Medicare Part D prescription drug program added $550 billion to the debt. He did not try to control higher mandatory spending on Social Security and Medicare. In 2005, Hurricane Katrina hit New Orleans. It caused $200 billion in damage and slowed growth to 1.5 percent in the fourth quarter. Bush added $33 billion to the FY 2006 budget to help with clean up. Bush deregulated with the 2005 Bankruptcy Prevention Act. It protected businesses by making it harder for people to default. As a result, homeowners had to take equity out of their homes to pay off debts. That sent mortgage defaults up 14 percent. It forced 200,000 families out of their homes each year after the bill was passed. Most of the debt was incurred by the cost of healthcare, the No.1 cause of bankruptcy. That aggravated the subprime mortgage crisis. In 2008, Bush sent out tax rebate checks. Bush's response to the 2008 global financial crisis was business-friendly. The federal government took over mortgage agencies Fannie Mae and Freddie Mac. It brokered a deal to bail out Bear Sterns. It tried and failed to keep Lehman Brothers from collapse. Bush approved a $700 billion bailout package for banks to prevent the U.S. banking system from collapsing. The Republicans in Congress disagreed at first but eventually went along with that massive government intervention. Instead of reducing the debt, Bush more than doubled it. He added $5.849 trillion, the second-greatest amount of any president. That's more than the $5.8 trillion debt at the end of FY 2001, President Clinton's last budget. Donald Trump's economic plan followed Republican policies except for trade and immigration. His impact is yet to be determined. Trump pursued deregulation with executive orders. He promised to loosen Dodd-Frank regulations that prevent banks from lending to small businesses. He allowed construction of the Keystone XL and Dakota Access pipelines. He wanted to keep the minimum wage where it is so U.S. companies can compete. He promised to increase defense spending by $54 billion. He promised to pay for it with cuts in other departments. He would finance $1 trillion to rebuild U.S. infrastructure with a public/private partnership. He promised to increase defense spending by $54 billion. He promised to pay for it with cuts in other departments. He would finance $1 trillion to rebuild U.S. infrastructure with a public/private partnership. Experts disagree on whether Trump can bring back American jobs. Trump's health care plan to replace Obamacare relied on age-related tax credits. It sought to eliminate the Affordable Care Act's taxes and its mandates that required people to purchase insurance. But it failed on March 24, 2017, when there weren't enough Republican votes to pass the House. Trump's tax plan would reduce income and corporate tax rates. He promised to eliminate the marriage penalty, the Alternative Minimum Tax, and the inheritance tax. But some tax policies were not business-friendly. Trump planned to end the tax deferral on the $5 trillion in corporate cash held abroad. He would allow a one-time repatriation taxed at 10 percent. He also promised to eliminate the "carried interest" deduction. The Trump tax cuts that were implemented ended up benefiting mainly wealthy Americans and corporations, rather than ordinary middle-class families or workers. Ironically, these tax cuts seem to have increased the national debt to record levels. Trump's immigration policies were also not business-friendly. He tried to ban residents from six countries from entering the United States. Those countries are Syria, Iran, Libya, Somalia, Sudan, and Yemen. The judicial system blocked the ban because it was unconstitutional. Trump promised to spend $20 billion to build a wall blocking immigrants from Mexico trying to enter the United States illegally. He began deporting any immigrant staying illegally in the United States and bearing a criminal record. The ban worried companies in Silicon Valley who depend on immigrants from those countries among others. The other actions would also raise costs for businesses who depend on low-wage immigrants. Republicans traditionally support free trade agreements. Instead, Trump advocated protectionism. He withdrew from negotiations on the Trans-Pacific Partnership. He renegotiated NAFTA. He imposed tariffs on imports from China and Mexico. That launched a trade war with China and other trading partners. The impact has been particularly severe on the American agricultural sector. Soybean exports to China fell 94 percent after the tariffs took effect. Paradoxically, the trade deficit has continued to increase even as the trade war is underway. Trump promised to reduce the debt by eliminating waste and redundancy in federal spending. Instead, his debt reduction plan would add $5.3 trillion. That's ironic, given that he was one of the four presidents who donated his salary.